Note: Lavalava and ’ie tend to be used interchangeably although lavalava is technically a general term for all clothing. Before I had my own sixth grade classroom in Oakland, I trained teaching senior English over the summer. And the first thing you notice about an inner city senior is the grill. Even in my days as a twentysomething urbanite in San Francisco, I hadn’t witnessed anything close to a grill before. A grill is a bulky, gold-plated apparatus that fits over one’s teeth to achieve a look that is menacing and ornamental. But perhaps even stranger is how quickly I became used to it. The first time a student spoke to me with his grill all hulking and shiny, it set off a fight-or-flight response in my body. There was a kneejerk wince, a deer-in-the-headlights confusion; sweet Jesus, what is that thing? But, I swear, by day 2, I was over it. All of my students (girls and boys alike) had them, and my brain made the switch with relative ease. And that’s pretty much exactly how it’s been with the ‘ies. 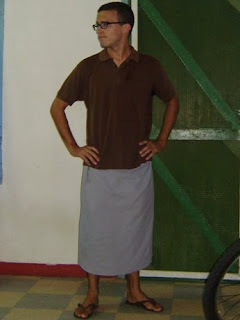 I remember in preparing to come to Samoa, a number of people in The States asked whether I would have to wear a skirt when I got here. I supposed so at the time, but I don’t think I had any idea that I would be wearing a lavalava every day here. But even more unexpected is how nonchalant it feels to wear it day in and day out. I get up every morning, decide which shirt I’m going to wear, and then discern which of my ‘ies matches best. It’s exactly the same thought process I used to choose slacks in The States. I had a tough time at first with the ’ie; not so much in accepting it as appropriate clothing but in the actual fastening of the ties that hold it on. As much as I like to pretend to be the assimilated American living in Samoa, nothing makes you feel more like a 5-year-old than host-mom or a fellow staff member fixing your waistband, putting her arms around you like she’s helping you properly re-secure your Huggies. And they don’t seem to be too much cooler than pants. The less formal lavalavas are made of thinner fabric, and they tend to breathe well, and wearing one makes sense. 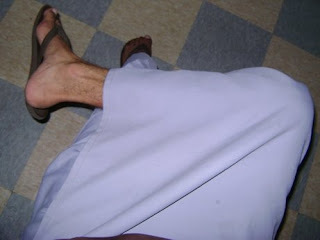 The more formal ’ie faitagas, ’ies with pockets, tend to be much thicker and on hot days, they’re sweltering. It’s interesting how quickly we want to make a foreign fashion our own though. The Peace Corps gave us black ones when we arrived, my host family gave me ’ies in white and grey, and I bought my blue one. But I have room in my wardrobe for a brown one and a green one. I feel like more color would allow me to better express myself. Ha. The ’ies available in Samoa tend to be monochromatic and a little uninteresting. But on a trip to Fiji, Dylan got a couple ’ies that had pin-stripes and other patterns… And when Dylan finished his service, they were his most sought-after possession. Unaware of their popularity, I casually asked about them, and Dylan told me I had to get in line behind half of Savai’i. Finally, it’s weird how once you’re in the mindset that a lavalava is fashionably appropriate, it’s hard to remember the way things were before. Before Dylan left, he was talking about a wedding he was going to attend soon after he returned to The States, and how he thought it would be kinda cool to wear an ’ie to the ceremony. And the rest of us agreed. And then I said, “Well why couldn’t you? You totally could.” But after receiving blank stares from the rest of the group, I thought about it a little more and agreed that it would just be weird and baffling to the rest of the wedding party. I should point out that when I’m not teaching or engaged in otherwise formal activities, I wear shorts. I don’t really spend leisure time in my ’ie. And whenever Peace Corps volunteers are gathered together, it’s rare to see an ’ie. But still. They’re pretty comfortable. Might be good to wear to work on a hot day. Right? I hope you’re finding ways to ventilate. Pictures below. I tend to cross my legs like this fairly often. No Samoan has ever expressed a problem with this position, but I don't think I've ever seen a Samoan sit in this position. P.E. My favorite part of this picture is the three girls who are sitting off in the distance while the rest of the class either plays or actively watches volleyball. Those three girls were definitely in all of my P.E. classes growing up. I guess some things are universal. The grill thing totally cracked me up. Really? 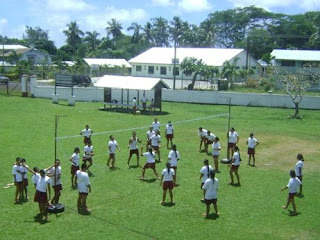 In Samoa too! Your writing is on a roll. Good stuff. I can't imagine Dad saying that. I hope that Dustin & Dad wear a lava lava when they go. Hi, I found your blog searching about ie's. My brother has several lavalavas but, would like an ie to wear to my sister's wedding. I have found them online but they are very pricey. I want to make one for him but can't get a clear picture of the ties/buckles/button to know how to do it do you think you could post a pic or e-mail me?